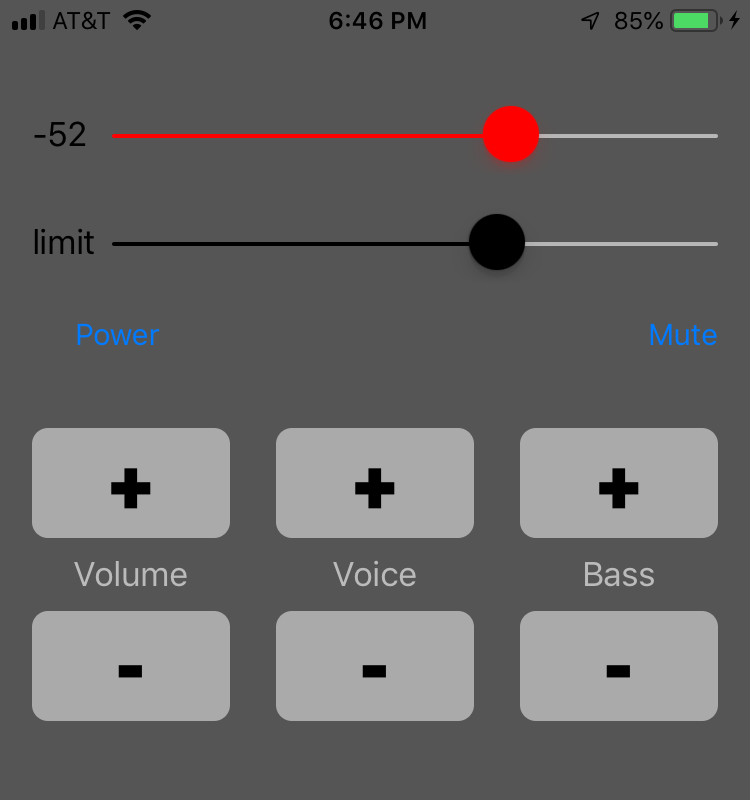 I made an iOS app to remote control a television sound bar. The app makes requests to a raspberry pi running a Flask server on the local network. The Raspberry Pi uses LIRC (Linux Infrared Remote Control) to send commands to an attached infrared transmitter. The view has a slider displaying audio level, a slider to set the limit, and buttons to send remote control commands. AudioMonitor.swift levelTimerCallback repeatedly posts a notification containing audio level. AVAudioRecorder averagePower(forChannel:) normally ranges from -160 dB (quietest) to 0 dB full scale (louder). “If the signal provided to the audio recorder exceeds ±full scale, then the return value may exceed 0 (that is, it may enter the positive range).” Indoors I typically see range approximately -60 to -30 dB. // you must call the updateMeters() method before calling averagePower. The iOS app could be modified to automatically send a volume decrease command whenever the audio level exceeds the limit. Alternatively, the Raspberry Pi app remy_python could be modified to automatically control sound level. For example the Pi could automatically decrease or mute the sound whenever a commercial is detected e.g. Remote control television by sending commands from iOS device to a server. how to monitor audio input on ios using swift - example? Make a Raspberry Pi infrared remote control. The device can programmatically control television sound bar audio volume. The Raspberry Pi uses LIRC (Linux Infrared Remote Control) to send commands to an attached infrared transmitter. A Flask web service to accept television command requests (e.g. volume decrease, volume increase). The README includes links to similar remote control projects, infrared remote control hardware.